General Admission Tickets get you full access to all off-track activities for the whole weekend, FRIDAY - SUNDAY. This price also includes entry into the event for all 3 days including both days of #AFTERGRID music. Camping passes must be purchased separately. EARLY ENTRY (Thursday) NOT INCLUDED!! Single day ticket for Saturday only. Includes entry into GRIDLIFE for all racing and concert activities. Single day ticket for Sunday only. CAMPING NOT AVAILABLE WITH SINGLE DAY TICKETS. This ticket includes camping for 1 person and entry for 1 vehicle. This is festival style car camping. Each vehicle will get roughly a 10x30 spot to park and set up camp. Arrive together to camp together. No saving spots. Only 1 vehicle per campsite. No Exceptions. Everyone in the vehicle must also have a Spectator / Car Pool Camping Pass. Must be a normal sized passenger car, truck or van. No UHauls, RV's or Trailers. Camping is 18+ Unless with parent or guardian. General Camping Pass for carpool passengers. Vehicle entry not included. Camping is 18+ Unless with parent or LEGAL guardian. The family quiet camping area is located closer to the paddock away from the good times in the back 40. This area is intended for race crews, families and those that wish to have a little more peace and quiet at night. Attendees 12 and under free with parent. The RV pass is required for each RV to enter the festival and park in the RV specific areas of the Campground. This pass includes entry for your RV. Everyone traveling within the RV will also have to purchase a passenger / car pool camping pass. An RV is defined as any vehicle larger than a 15 passenger van. Pre Approval Required - Camping Not included. SHOWCASE ENTRY IS SUBJECT TO APPROVAL. NON APPROVED VEHICLES WILL BE REFUNDED PURCHASE PRICE. 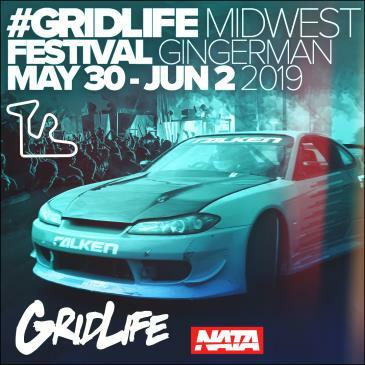 Entry into the #GRIDLIFE Showcase includes a 3 day admission. Showcase grounds are a mix of paved and prepped turf. The actual show will take place Saturday from noon until 6pm with awards following. Showcase participants will be able to leave their vehicle in the show grounds for the duration of the festival. CAMPING PASS FOR SHOWCASE ENTRYS ONLY. Includes overnight access for all 3 days. ONLY VALID IN COMBO WITH SHOWCASE TICKET. Grab the squad and save some bucks. The car pool pack is all you need to get you and a carload of friends hanging all weekend on the GRID. Leave the setup to us and GRID in style in our new Track Side Spectator Hill GlampGround. Glamping packages include a pre setup weather proof round canvas tent, 4 cots a nightstand table with power outlet and a exclusive #GRIDLIFE GlampGround swag survival kit. Check out the Glamping setup here. ULTRA LIMITED Infield Crew Corral. Lock down your space for the whole weekend with a dedicated 50x50 Campsite in the heart of the back 40. NOTE: This is not a trackside corral these will be sectioned off areas in the GA Campground. (PER VEHICLE) Thursday Access for Campers. Get to the grid a day early and lock your spot for the best weekend of the year. The EARLY ACCESS PASS gets your whole car and all passengers into the festival before the rest of the general public. EARLY ACCESS PASS IS PER VEHICLE. ALL OCCUPANTS MUST HAVE BOTH A 3 DAY GA TICKET A SPECTATOR CAMPING PASS AS WELL AS A VEHICLE CAMPING PASS! AVAILABLE ONLY FOR CAMPING ATTENDEES. 3 Day Parking Pass for one Vehicle. In order to control access and plan a better #GRIDLIFE experience all vehicles entering the festival must have a vehicle pass. This ticket gains your vehicle access to the day parking lot on site at #GRIDLIFE. This pass is good for the entire weekend Friday - Saturday. One Time Re-Entry access for Campers. In order to control access and plan a better #GRIDLIFE experience all vehicles exiting the festival ground must have a re-entry pass to return into the festival grounds. Both municipality and insurance concerns have forced us to make this a requirement this year. Please Plan to arrive with everything you need for the weekend as to limit the need to exit and re-enter the festival if you must exit to purchase supplies / etc please plan to carpool your supply runs. Price is per vehicle and good for the entire weekend. 3 Days of Racing, Camping, Music & More. Full course drifting returns to Gingerman raceway with another year of pros, special guests and super friends shredding tires all weekend long. Positioned in the heart of the GRIDLIFE festival is the GRIDLIFE Showcase, featuring a diverse meet style car show with incredible builds across all styles, makes, and models.